Side-view, rear-view, mirror glass and/or mirror assembly! If you have a cracked, broken or missing side-view or rear-view mirror, we can replace it on-site! 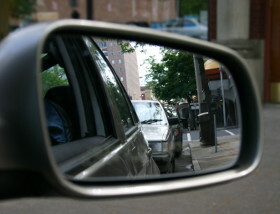 Don't go without the safety provided by your auto mirrors- get broken mirrors replaced today! We can replace just the mirror glass, or the entire mirror assembly, based on what you need and based on the make & model of your vehicle. With over 15 years of experience, we know exactly how to get the job done right, the first time! Got auto glass problems? Curbside specializes in windshield replacement, chip repair, and mirror replacement. We come to you with mobile repairs, so you don't have to interrupt your life to get a mirror fixed. Call today for a quote on the high quality repair you deserve, or Start a quote online. What are you waiting for? Don't spend another day with damaged or broken auto glass or mirrors! Call Curbside Auto Glass today, 623.374.9462.